This site is dedicated to all of us retiree snowbirds who seek an affordable and healthy way to escape the northern winters and enjoy life to its fullest. The purpose of this site is to help address the 'crossover/confusion' between those parks focused only on the RVs and those with a mixture of RV spaces and more permanent Park Model units. The parks you see on this page listed as 'featured parks' combine RV spaces and park models. While many provide short term RV stays most of the RVers in these parks want a longer stay and become part of the park 'community'. Participate in the many clubs and park activities and develop friendships. When starting the snowbirdtrailer.com site in 2009 (to focus on park model lifestyle) we discovered that a high percentage of the park model owners began as RVers. They found their preference was to stay in one park rather than travel around any more. Then discovered they may as well opt for a park model. We have begun with a concentration on the state of AZ and specifically the Phoenix East Valley area, but also Yuma, Tucson, and points in between. The Phoenix east valley includes the cities of Mesa and Apache Junction as well as other parts of Maricopa County and Pinal County. Check out the 'Featured RVer Parks' in Tucson and Phoenix (below) on the left column. Rincon and Desert Shadows focus on the snowbird RVers with reasonable rates in THE BEST RV PARKS AROUND . Click on the ad to check out their websites. What is this RV Site all about? Just checking out the Arizona winter experience for the first time - 'have never been'. Already have visited and maybe spent some time in a park and now want to find an RV or Park Model to rent or buy. Resort Park Model owners who want to find information on upkeep, repair, and renovation. Take the time to 'Browse Around' the site. If you are new at this experience make sure to take the time to read ... First Time Rentng or Buying in Resorts or RV Parks ... About Arizona Weather. Check out some of the Recreational Vehicle parks websites on the Park Chart and pay special attention to their facilities and activities. It will help you get a sense of what it is like. If you are looking for an RV to rent or buy make sure you are familiar with all the park model and RV park options. Check out some of the ad listings in the Park Models for Sale or Rent section. This site is not affiliated with any park or any other organization. Any ads you see on the site are placed by and are the responsibility of the advertising business or individual. Park model ads are placed by the owners of the park model or their licensed representative. Any and all contact should be made directly with the advertiser. Of course those who are new at this will have the most questions. Much of our early emphasis on the site is for those who have never experienced time in the Recreational Vehicle Resort Parks or maybe never experienced winter time in Arizona. Part of the motivation for developing the site comes from the many requests we have received from back home ('up north') for information on this lifestyle experience. We are providing information to help people get a sense of what this experience is all about. To answer many of those questions of 'how do we?' ... 'where do we?' ... 'what do we?' ... and the like. We are sure that those same questions are asked all over the northern United States and Canada. There are 100,000s of snowbirds who spend their winters in the southern U.S. They come from the northern United States and from all across Canada. The latest study done by the Arizona State University (ASU) on the snowbird market determined that (in 2003) there were 300,000 snowbirds who become semi-permanent residents in Arizona over the winter months. This figure does not include the more casual short-term winter vacationers who stay in hotels or travel through in RVs, 5th wheels or other means. Snowbirds spending the winter in the south live in a wide variety of accommodations. 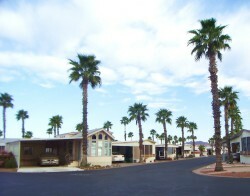 Some use traveling RVs, some rent or buy condominiums, and some rent or buy a park model trailer in an RV Resort park. This latter group represents the largest proportion of snowbird residents. In 2003 there were 160,000 snowbirds living in about 80,000 park model trailers. A large percentage are in the Phoenix AZ area. The highest concentration being the Phoenix East Valley area which includes the cities of Mesa and Apache Junction. This area has about 33,000 trailer spaces, mostly located in the many RV resort parks. One (unexpected) challenge in developing this site was what to call it and how to describe our focus on RV living in Arizona resort parks. It is difficult to know what to call either the parks or the trailers. (Or even the residents) Some refer to the parks as Retirement Trailer Parks, or Seniors Parks, or Snowbird Mobile Home Parks or 55+ Trailer Parks. The formal name used by most of the parks is RV Resort Parks. But that does cause some confusion. They certainly are a 'resort' but the reference to 'RV' suggests something quite different. To those 'up north', who are new at this, the term RV park conjures up more of a 'campground' for the traveling RVers. We have found people back home tend to ask about 'those retirement trailer parks in Arizona' or those 'senior mobile home parks' or those 'Arizona trailer parks' or any combination therof. The parks being featured here are those parks that cater mostly to park model style trailers that are almost permanent. While most of these parks also offer short-term stays for RVs (i.e. motorhomes or other trailers) they are really quite different than those 'RV' parks dedicated to visitors mostly 'traveling through'. They should probably be called Park Model Resort Parks for Snowbirds or something similar. Many of the parks actually started out by catering to the 'shorter stay' traveler. But what happened is that people began to stay longer and longer. It then became more reasonable to leave the trailer or RV at the park over the summer. But then there was little need to move the trailer or RV so a park model style trailer was designed and developed (actually more 'evolved') to be almost permanent but still remain a 'trailer'. But the parks continued to be known as 'RV' parks.